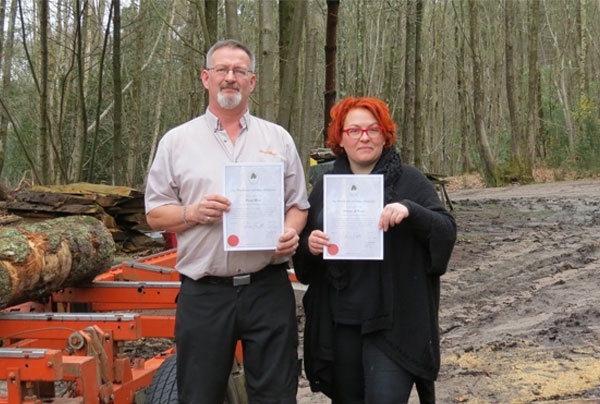 Corporate membership numbers at Woodland Heritage have received a boost this month with the welcome addition of two forestry-based businesses. Wood-Mizer UK and Sussex-based Artizans of Wood have continued a trend for the charity of an increasing number of corporate members coming from the growing and processing parts of the timber supply chain, replacing businesses from the furniture-making sector, where the charity has its roots. ‘Woodland Heritage was created in 1994 by two cabinet makers keen to ‘put something back’’, said Guy Corbett-Marshall, Woodland Heritage’s Development Director. ‘Whilst many furniture makers and retailers still support the charity, changing demand has seen many others shrink in size or disappear, so it is really encouraging to see our supporter base move with the times and for businesses like Wood-Mizer UK and Artizans of Wood to join us instead’. Wood-Mizer UK has been supplying and servicing sawmills to customers in the UK and Ireland since 2004, many of whom are mobile sawyers who have well established businesses. Other customers include tree surgeons looking to diversify and woodworkers keen to mill timber in their workshops to meet their precise needs. Artizans of Wood specialise in constructing Roundwood timber buildings which can vary from outdoor classrooms, garden offices and barns through to bespoke constructions that are crafted to meet a customer’s exact requirements. Artizans are keen to share their knowledge too, running courses in Roundwood Timber Framing from spring to autumn this year. ‘Becoming a Corporate Member of Woodland Heritage brings benefits to a business and to the forestry sector’, said Mr Corbett-Marshall. ‘As well as receiving a copy of the ever-popular Woodland Heritage Journal, members can join the annual Field Weekend which always brings stimulating debate set in the finest forestry estates in a different region of the UK each year.But membership also enables the business to ‘put something back’, as its support helps Woodland Heritage to subsidise young foresters to attend training courses each year, including its own ‘From Woodland to Workshop’ courses, and to help fund research into major issues facing the industry such as Acute Oak Decline. Corporate Members can also use Woodland Heritage’s logo on their publicity materials as a way of showing they support the charity’s principles in their day-to-day work’. Corporate Membership of Woodland Heritage starts at just £100pa with details available at www.woodlandheritage.org.uk, a website that also provides latest news on the annual Field Weekend, the forthcoming ‘From Woodland to Workshop’ course in May and with the latest copy of the Journal available as a free download.